Behold, the new KRK burger now sizzling at an iconic Milwaukee area custard joint. Well, maybe it’s not that new. This postcard is being handed out at Kopp’s Frozen Custard locations promoting the new burger. The restaurant famous for its frozen custard unveiled this new burger that’s actually 67 years old. 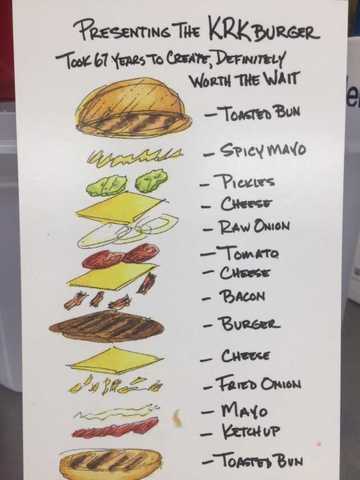 The burger dons the owner Karl Kopp's initials and includes spicy mayo, bacon, fried and raw onions, three slices of cheese and more between two toasted buns. Kopp’s has locations in Glendale, Brookfield and Greenfield.